Ten June: I Need Your Vote! 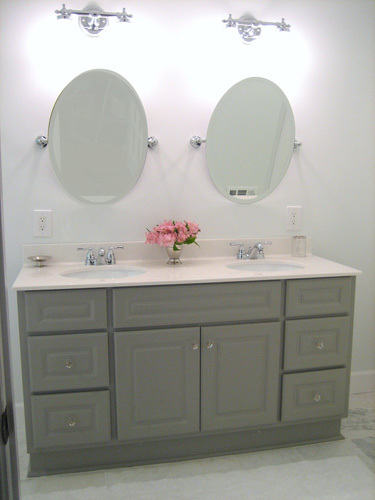 Were you a big fan of our master bathroom renovation? If so, I'm asking for a favor! One Project Closer nominated our renovation as one of their weekly picks for their summertime "Before & After Series." You can see the original feature the room here. It's a really cool program, because not only did David and I win a $50 Home Depot gift card, but OPC donated $100 to Habitat for Humanity in our honor! Can't beat that. Now that summer has come to a close, One Project Closer is picking a final winner from all of the summer projects. Well, actually... YOU are picking a final winner! It's an open vote! Thanks so much, friends! Have a great weekend. I'll vote....it is a wonderful bathroom! Voted! You're in the lead! Woohoo! You've got my vote! :) Loved your bathroom! Good luck Michelle! What a cool contest! Shot over there and voted... good luck! DUH my little Rhonda B. going to vote now. Just voted- love how it turned out! Good luck!! Yes maam---just voted! Good Luck! I voted for you! Looks like you're in the lead! I'll keep my fingers crossed. Can we vote more than once? I just voted for you! :) We just bought a house so I've been going through your home renovation posts for ideas - You & David have done such an amazing job to make your home so beautiful!!! I voted for you!! Good luck!! Your bathroom looks amazing!!! I love it!! You gotta vote for your hometown girl!! Good luck!! Voted for you! Fingers crossed! Voted! Good luck! I totally think you'll win it! You got my vote! I seriously love your new bathroom. Hope you win!! Just voted! LOVE that bathroom. Hope you are having a good weekend! Definitely just voted for you!! Good Luck girl!! Voted!! PS-I would love to help you out with a Halloween party next year!! I voted for your fab bathroom! Wedding Photos & A Challenge! I Heart Fall. Like, A Lot.